weather system as it spews chemically charged ash high into earth’s atmosphere. Violent and powerful geological activity is having various effects on our atmosphere, oceans, and most importantly, our climate. The key question is just how much? One thing is certain, the increase in geological activity is a climate science wake-up call. In the past three years alone there has been a noticeable increase in the number of powerful global earthquakes and volcanic eruptions. Photos of these events are dramatic, captivating, and to many folks, a little frightening (see Figure 1). This is especially true for those who realize that in some cases multiple geological events have occurred within very short time periods, days, or weeks. For example, on August 3, 2016, many powerful volcanic eruptions on land seemingly occurred at once: Alaska’s Mount Pavlof was pouring ash high into the atmosphere; three major Indonesian volcanoes was shooting so much ash it blocked air travel; Mount Popocatepetl blanketed Mexico City in ash; and two erupting volcanoes near Antarctica were ejecting sulfur-laden ash and threatening the life of one million penguins. All this has caused some to question the geological stability of planet Earth, while others are convinced we are entering the so-called “Biblical end days”. Let’s begin by answering the question on everyone’s mind: Is all this recent geological activity abnormal? The answer is absolutely not! In fact, it is quite normal and actually fits nicely into historical trends. For example, beginning in or around 1964, and after 50 years of relative geological stability, planet Earth became more “earthquake” active. 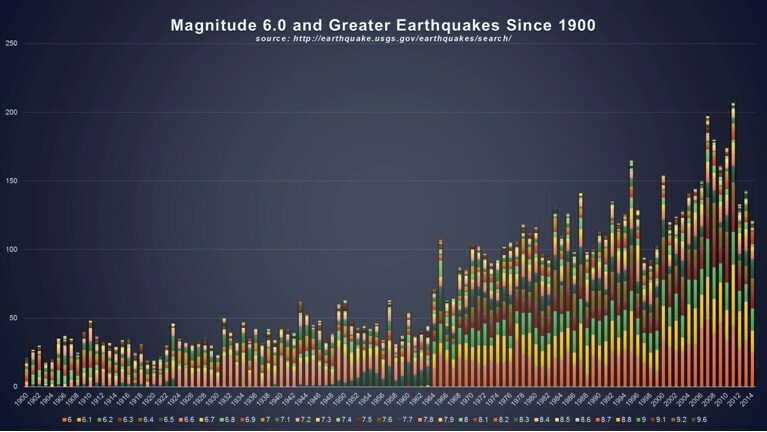 Every year since 1964 there has been an increase in the number of earthquakes, including those of high magnitude (Figure 2). Worldwide volcanic eruptions have followed a similar trend, increasing in numbers and strength for many years (see here). Concerning the highly publicized, worldwide 2014-2016 mega-pulse of increased geological activity, the United States Geological Survey (USGS) says that it is not historically unprecedented, above average, yes, however, not at all unusual (see quote below). Now that we can relax and not worry about the world ending let’s discuss a more important question and the focus of this article. Exactly how much influence has all this geological activity had on our climate and climate-related events? The answer to this question from the consensus climate science community can be characterized as “not much.” These folks contend that atmospheric forces almost exclusively drive Earth’s climate and climate-related events. Their computer-driven climate models largely use atmospheric input data and their research studies almost always conclude that it’s all about the atmosphere. Consensus climate scientists have begrudgingly acknowledged that a few “once in a lifetime” major dry-land eruptions, such as Mount Pinatubo 1991, did have some short-term effect. However, to date, climate scientists remain “atmospherically biased”. First, 90 percent of all volcanic eruptions and earthquakes occur in very remote Deep ocean or sub-polar ice cap regions. It may surprise you to know that these regions, the most active geological regions on Earth, are virtually unmonitored and explored! Only five percent of these regions have been viewed with human eyes. The few times humans have ventured into these regions they have discovered very active geological features that are emitting huge amounts of hot lava and superheated, chemically charged seawater (CO2, methane gas, sulfur, iron, etc…) and particulate matter. There are two sensing systems that provide small amounts of low-resolution fluid flow and temperature data from these remote areas: orbital satellites and the Argo Ocean Buoy System. Neither provides detailed or accurate data from the literally thousands of individual active volcanoes, hydrothermal vents, or faults known to exist in these remote regions. This previous Climate Change Dispatch article details why the ARGO Ocean Buoy System is inadequate (here). Concerning the orbital satellites, they just cannot properly record heat and fluid flows from Deep Ocean depths or beneath thousands of feet of polar ice. The second and most telling reason that geological forces are likely to drive a significant portion of our ancient and present day climate is related to the results of recent research studies and freelance scientific articles. These studies all show that geological forces have a measurable and significant impact on our climate. A small sampling of these reports follows: MIT “Volcanoes Contribute to Recent Warming Hiatus”, Lamont-Doherty Earth Observatory “Seafloor Volcano Pulses May Alter Climate”, Princeton “Volcanoes, Not Meteorite, Killed Dinosaurs”, GEOMAR “Did Volcano Eruptions Tip Europe Into Dark Ages?, ”University of Texas “Researchers Find Major West Antarctic Glacier melting from Geothermal Sources” , J. Kamis “Why El Niño’s and La Nina’s are One Continuous Geological Event”, andJ. Kamis “Gulf Stream Shut Down Caused by Geological Heat Flow”. In summary, a growing chorus of consensus climate scientists is starting to realize it is no longer realistic to argue that atmospheric forces exclusively drive Earth’s historical or present day climate. In contrast, the Plate Climatology Theory proposed two years ago continues to be the best answer to how and why geological forces are important, although secondary, drivers of Earth’s climate and climate-related events.